The City of Billings landfill will be be charging a tipping fee for waste disposal effective July 1, 2014. In order to be equitable with this charge, MacKenzie will no longer be able to pick up garbage outside the provided cart unless a charge is assessed. Charges for extra waste would depend on how much we have to pickup. If you have extra garbage or grass bags to be picked up the driver will note it and our office will contact you with options for pickup. 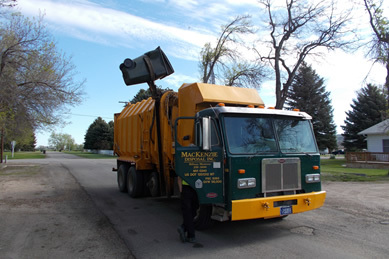 Because of the extra time it takes to collect loose garbage, and to ensure all of our customers are serviced in a timely manner, an additional cart would be the most efficient and cost effective in this situation and we will be happy to give you a quote on our recently reduced rate if you contact our office. Keep in mind that loose garbage is hard to contain when dumping, if you can bag please do so. This also helps keep our neighborhoods clean! Our summer has almost passed but please remind children that garbage trucks are in the area and to be cautious. If a temporary storage unit is needed for moving or construction reasons please call the Montana Go Minis phone # at 406-259-0400.